Reference number for this case: 27-Oct-54-Rouvignies. Thank you for including this reference number in any correspondence with me regarding this case. A non-anonymous man having visited my website spontaneously sent an email to me on September 18, 2014, to give his report on his observation of a craft with occupants; which he dated Wednesday, October 27, 1954. 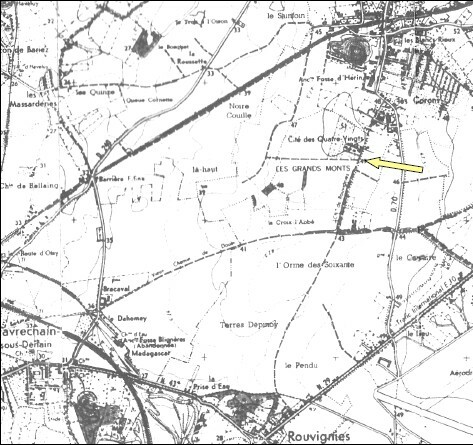 He indicated that he was then lived with his family in Rouvignies, between Valenciennes and Denain, and he indicated the precise address, in a mining district. 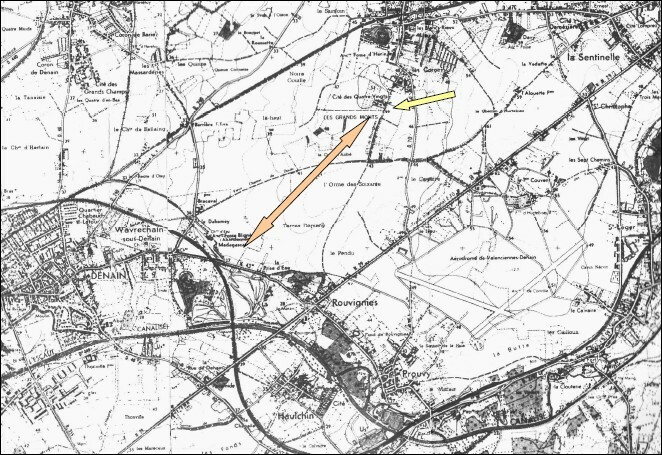 He indicated that in front of the house, there was a cultivated plain, in soft slope, which extended on approximately 3 km until Wavrechain-sous-Denain. In this plain, there was only one small farm located in the slope at approximately 800 m of his home. He joined two extracts of IGN maps, visible below, showing these places. The family, he said, awaited the return of the father, usually at about 11 p.m. The father was in the afternoon team, from 2 p.m. to 10 p.m., in Thiers. The two younger children, a 4-year-old boy and a 1-year-old girl, were asleep. A 12-year-old brother and an 8-year-old sister were doing their homework, playing, spending the evening in various ways with their mother; there was no TV set at their home back then. He indicated the first names of all these family members. They were then in the main room of the housing, whose shutters were closed. Nest was a small kitchen whose shutters were open. In front of them, at a distance of perhaps 100 or 200 meters, two large headlights lit the ground. The color was of an intense white, raw. Above these headlights, were three rectangular openings, inside, there was a lighting of a light green color green of very great intensity. Above and below these openings, there was a row of multicolored twinkling lamps, extremely brilliant and scintillating. They did not distinguish contours of the apparatus, the night being very dark, without moon, and the lights were too strong. In front of the headlight which was on the right (from their point of view), there was a squatted individual, and in front of him another individual, half bent. They distinguished only their silhouettes because of the strong luminosity of the headlights. Behind the opening on the right-hand side of the craft, an individual sat, seen from his side, he was directed as looking towards the left, and seemed to handle something. Behind him, they saw many buttons, multicolored, and dials. Suddenly, this individual stood up, approached the opening. The two individuals outside stood up, moved quickly towards the left and they were not seen any more. At once, the craft moved towards the right, its two headlights illuminating the ground during the displacement, and very quickly, they lit the small thicket located at approximately 500 meters, when the craft passed near it. (The author of testimony joined a diagram of the positions and departure of the machine, visible below in this file). Then there was nothing any more to see. There had been no noise during the events. At once, the mother and the elder brother had evoked the rumor of the landing of a flying saucer in Quarouble which had circulated in the previous weeks, and they had concluded that they had just seen an event of the same kind. The next day, Thursday, October 28, 1954 was an off-school day, so the elder brother went to the field where the craft had been. The ground was softened because of the rains of the previous days. He saw traces of agricultural carriage or tractor, whose rounded edges made think that they were certainly old. He saw leaves, some sugar beets, but nothing unusual. Date: September 18, 2014, 06:02 p.m. I just found your ufo website on the Internet. Congratulations for this wonderful work. Here is the report of my personal observation that took place on October 27, 1954 in Rouvignies in the Nord. October 27, 1954 - A Wednesday, between 9 and 10 p.m.. We reside in Rouvignies, between Valenciennes and Denain, at [address] in a mining district. In front of the house, a cultivated plain, gently sloping, which spans about 3 km to Wavrechain-sous-Denain. 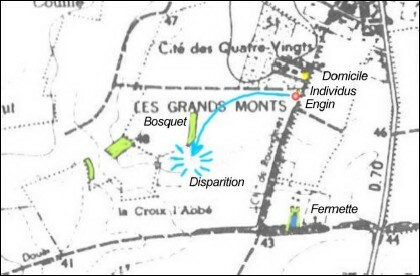 Only one small farmhouse is located below at approximately 800 m.
We await the return of the father (usually around 11 p.m.), who is the afternoon team in Thiers (2 p.m. - 10 p.m.). The two youngest children, [First name of 4-year-old brother] and [First name of 1-year-old sister] (4 and 1 years old), sleep, [12-year-old brother first name] (12 years old) and [First name of 8-year-old sister] (8 years old) do their homework, play, spend the evening variously with their mother [Mother first name] (television was not yet part of the family setting). We are in the main room of the housing, shose the shutters are closed. Besides, there is a small kitchen where the shutters are open. Suddenly our attention is attracted by multicolored flashes reflecting off the kitchen walls. 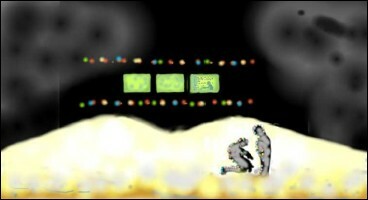 All three, we rush into the kitchen to see, outside of the house, an extravaganza of lights. In front of us, at a distance of 100/200 m ?? ?, two large headlights illuminate the ground. The color is an intense white, raw. Above these headlights, three rectangular openings, inside a lighting of a light green color of great intensity. Above and below these openings, a line of colorful very bright and sparkling flashing lights. In frot of the headlight of the right (at our right), an individual is squatting in front of him another individual is half bent. Only the silhouettes are distinguished because of the strong brightness of the headlights. Behind the opening of the right of the craft, an individual is sitting seen from the side, looking toward the left. He seems to handle something. Behind him, we see many buttons, multicolored, and dials. Suddenly, the individual stands up, approaches the opening. Both individuals outside get up, move quickly to the left and you see them no more. We do not distinguish the shape of the craft, the night is very dark, no moon and the lights are too strong. Immediately the apparatus moves to the right, the two headlights illuminate the ground during the travel, and very quickly, they illuminate the small grove situated about 500m, passing nearby. Then nothing. During this event, you could not hear any noise. Immediately [Mother first name] and [12-year-old brother first name] mentioned the rumor of the landing of a flying saucer in Quarouble (Nord) that had circulated the previous weeks and concluded that they had witnessed an event like that one. October 28, 1954 - The next morning, a Thursday, a day off school, thus [12-year-old brother first name] goes to see the field where the craft had been. The ground is wet because of the rain of the previous days, he sees traces of farm truck or tractor, with quite rounded edges so definitely old, some leaves, some sugar beets and nothing special. It is obvious that for the moment I am not in a position to fully guarantee that the mail I received is not just an invention; however, it is not anonymous. It could constitute a CE3 previously unknown of, until 2016, of the French saucer flap of 1954. October 27, 1954, is really a Wednesday, as told in the report. There was indeed no visible moon at the time amd place of the observation, as the witness said. The moon was under the horizon from 06:18 p.m. on. I am aware that this proves nothing, but the contrary would have meant something. [pg1] Email and attached PDF report file with text and images, non anonymous, sent to me on September 18, 2014. 1.0 Patrick Gross October 19, 2016 First published.